According to Australian law enforcement personnel, a flaw discovered in Apple’s Maps application could prove deadly for motorists if action is not taken. 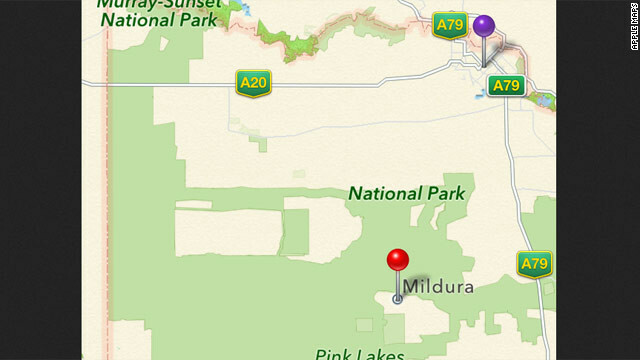 Pictured above is the city of Mildura, although that is not where the city is actually located. Apple has placed the town some 40 miles in the Outback, an environment that if not prepared for or you happen to become stranded in, offers very little in terms of road side service. Unfortunately, a few Maps users have already found themselves in this situation, needing to be rescued by emergency crews and were found with zero water supply. Police have contacted Apple in relation to the issue and hope the matter is rectified promptly to ensure the safety of motorists travelling to Mildura. Anyone travelling to Mildura or other locations within Victoria should rely on other forms of mapping until this matter is rectified. We like poking fun at Maps due to its laughable launch, but let us not forget Google’s failed launch of the Nexus Q. Although, I don’t recall the Q being blamed for anyone getting stranded in 114 degree weather with no food or water. Maybe that’s something we’ll get at this year’s I/O? Cheers Jason, Kurt, Poya, and Nicholas!